On the risk of repeating ourselves – Skylight at the Tobacco Dock in Wapping is really quite something. More an adult playground than just a roof top bar, you can have food and drinks, chill on a bean bag, look out at the London skyline, watch the sun set, enjoy their giant screen (both indoor and outdoor, just in case), laugh, cry or cheer and if the match goes all pear shaped, you can just pick up a croquet stick and score some goals (or wickets) yourself or relax with a laid back game of petanque. Life is good at Skylight – no matter what happens. Skylight is at the Tobacco Dock , Pennington Street, Wapping, London E1W 2SF. Entry is free but expect queues or try to book in advance. Budweiser is the official sponsor of the World Cup this year and they are offering the ultimate viewing experience for fans. The Bud Boat is taking to the water during the World Cup, and you can catch all the matches (and hopefully some rays) on their huge viewing screens on the top deck. As you cruise down the Thames, take in epic views of London with some tasty street food and an ice-cold Bud in hand. Post-match, big name DJs will be keeping the party going on the lower deck. The Bud Boat opens an hour before the match and will depart and drop off at Festival Pier, on Southbank. Tickets are £10, and you get access to the full boat experience, which will last around 5 hours, plus a Bud and a limited-edition Light Up Cup. 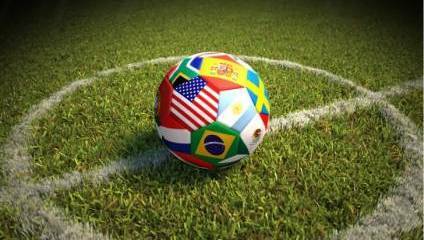 The legendary World Cup Pop Up of 2014 returns this year to Egg London, Kings Cross, to host their football fuelled party throughout the tournament. They’ll be opening theirs doors to the Loft & outdoor terrace for World Cup screenings and with football, food, craft beer, house and latino music on offer, dutiful fans can fully enjoy the matches, weather and infectious atmosphere provided by the Fat Ronaldo’s crew. With a giant outdoor screen in the sun and 6 jumbo indoor screens, world class club surround sound, fresh authentic homemade Italian pizzas, vintage reruns and face painters, Fat Ronaldo’s is a sports bar cranked up to 11. Fat Ronaldo’s is at Egg London, 200 York Way, King’s Cross. Entry is £10 including a pint or £20 including a pint and pizza. In case the temperatures actually get too high for open-air terraces and you need a place to cool down, Underdog Art Gallery should be quite a quirky and unusual location to watch a match. Located under one of the last remaining original arches in London Bridge, they have a huge space (that is not a cramped pub) with a giant projector screen to show the games, with art on the walls, craft beers, food and free merchandise giveaways courtesy of BrewDog. Underdog is at Arch 6, Crucifix Lane, London Bridge and entry is free. Please note due to a private event they will NOT be showing the England v. Sweden match on 7 July! If you, like us, are more arts and culture than sports, you don’t need to ruin your street cred – you can watch the World Cup in a theatre! This Victorian music hall turned nightclub has a whopping 24ft wide screen where the stage would be, and you can sit in your own private box, the balcony, which has two additional screens or stand in the pitch (er… auditorium). Enjoy interactive sing-a-longs and fan anthems, food, drinks and a themed photo booth for some great World Cup atmosphere. The Calpham Grand is at 21 - 25 Saint John's Hill, Clapham Junction, and tickets are between £5 (standing) and £100 (your own table on the balcony with waitress service).